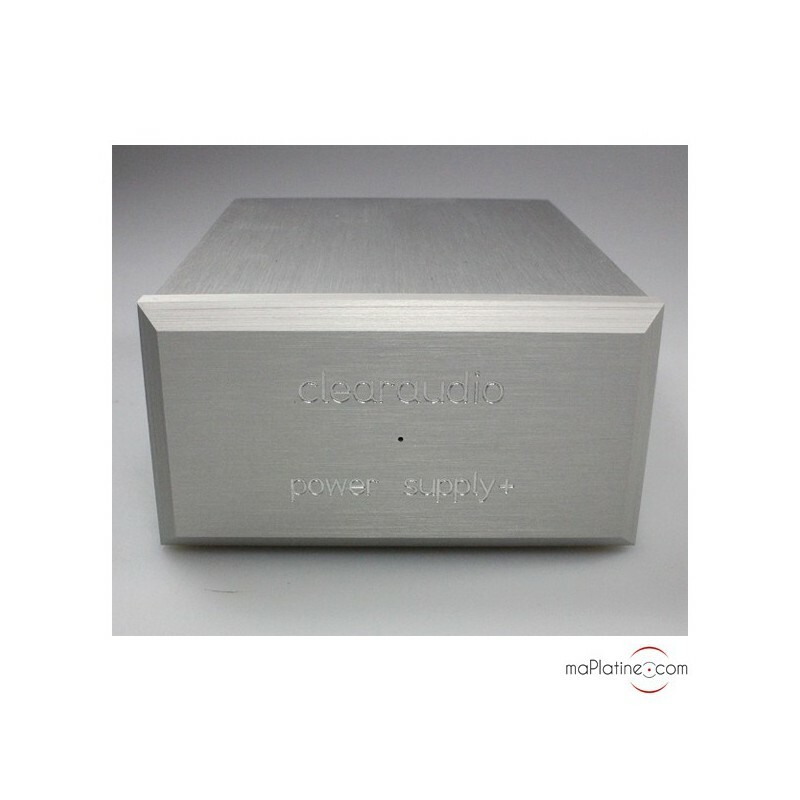 This phono preamplifier comes with two anti-resonance and non-magnetic housings, built in a beautiful brushed aluminium block. 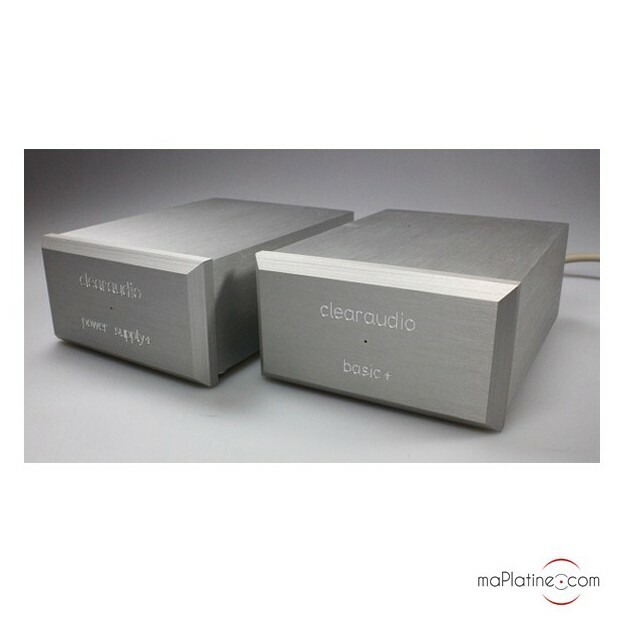 One of the housings accommodates the RIAA correction and the other the power supply with filter and regulation. The rear panel features two beautifully-crafted pairs of gold-plated RCA (input and output), a terminal that accepts an earthing wire or a banana plug for your vinyl turntable, ground, if it has one. On the underside, the Basic + Phono features two push buttons for the selection of the cartridge type (MM or MC). 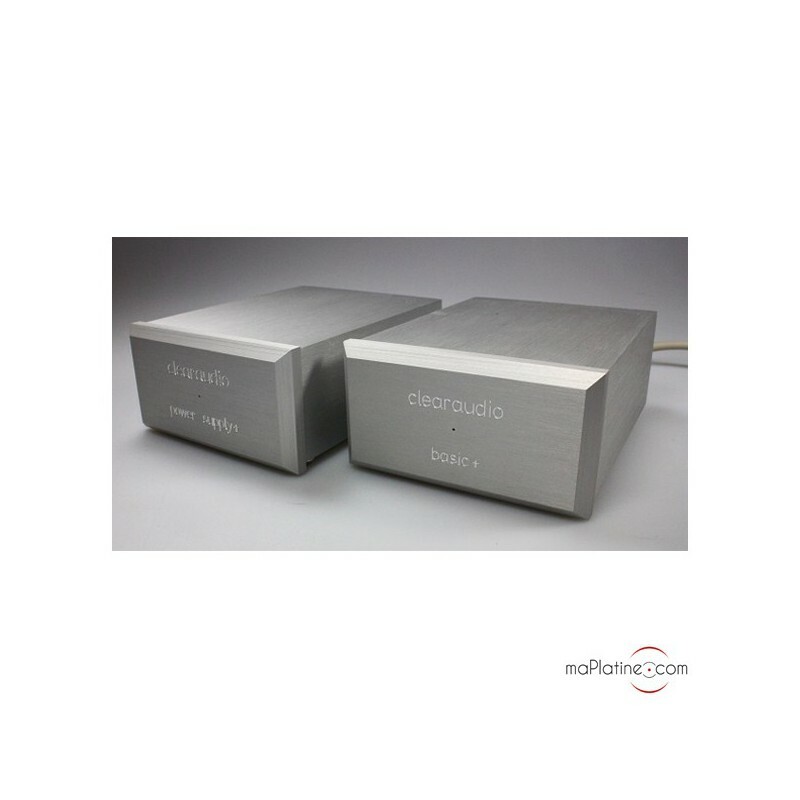 Note: these adjustments are completely separate for both channels as the phono preamplifier has a dual mono architecture. 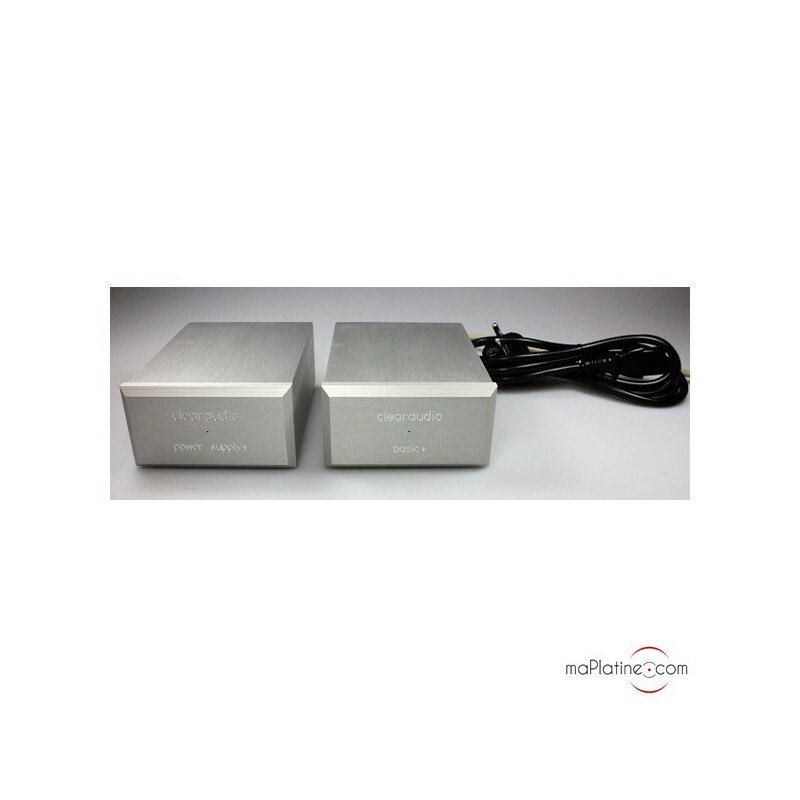 To pack as much technology as possible into this tiny box, the manufacturer has used surface mount technology (SMT) and very high quality integrated circuits according to SMD technology. 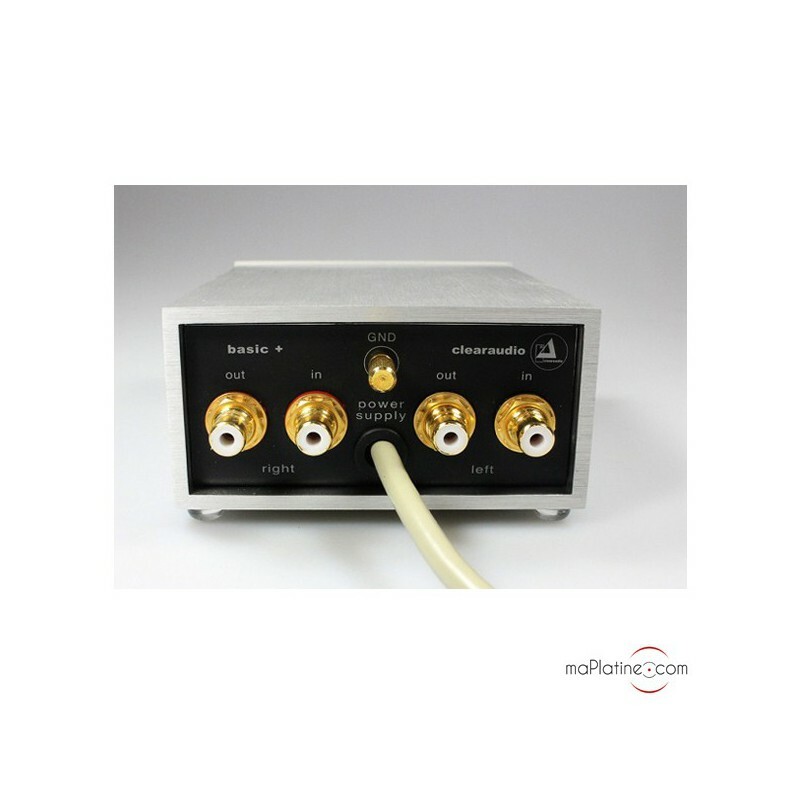 Their assembly with very short leads reduces noise and retains the dynamics and signal fidelity. 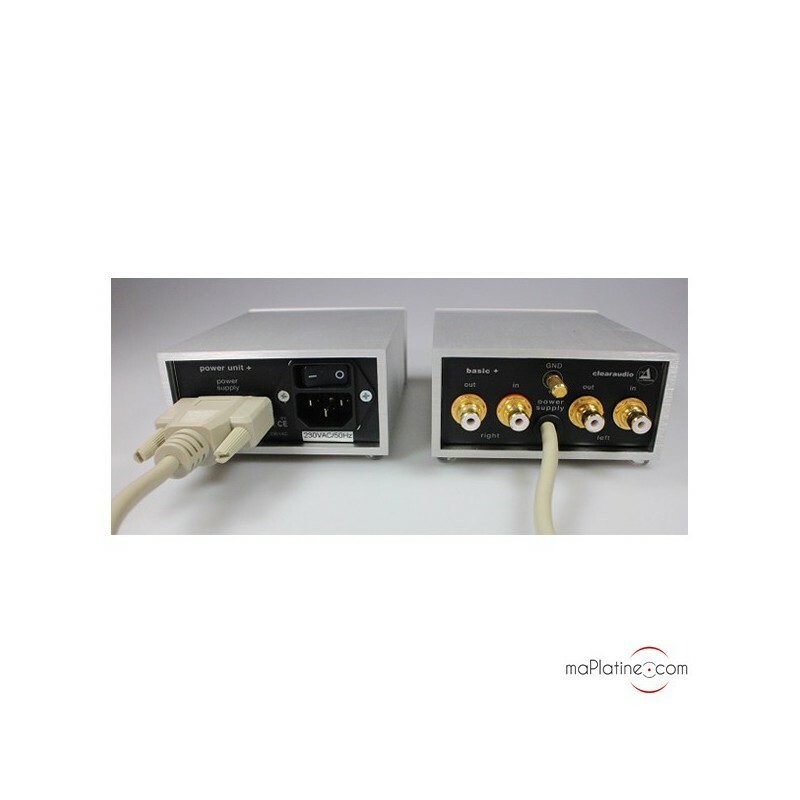 The impedance is automatically detected and compensated. Don't try to find an on/off switch...the Basic + does not have one. This is not for saving purposes, but because it will stay on continuously and that the circuits stay powered for best musicality. 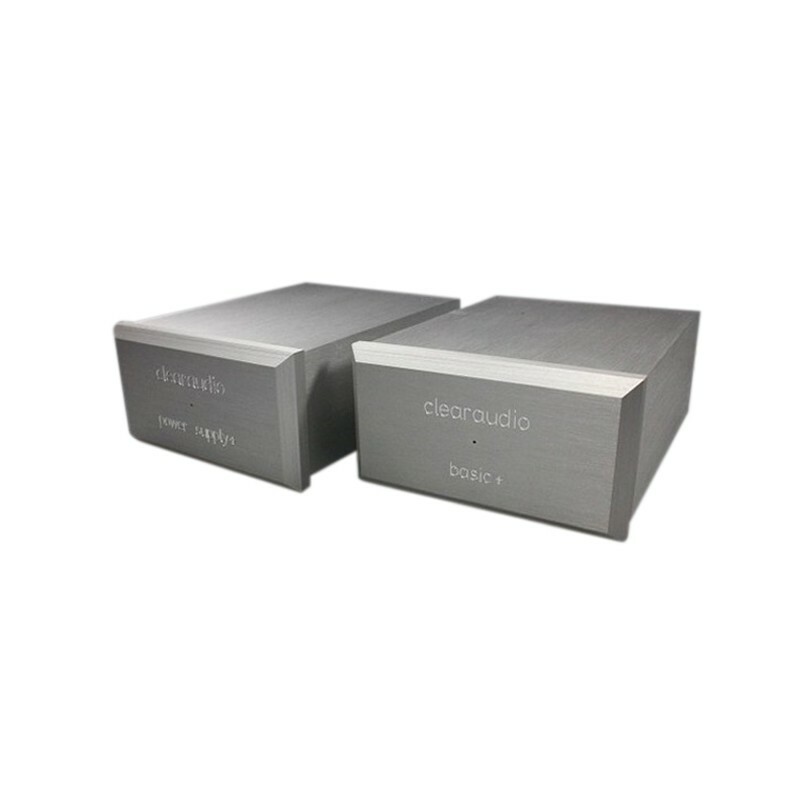 This highly versatile preamplifier boasts a superb highly symmetrical build, quite exclusive for this price range. 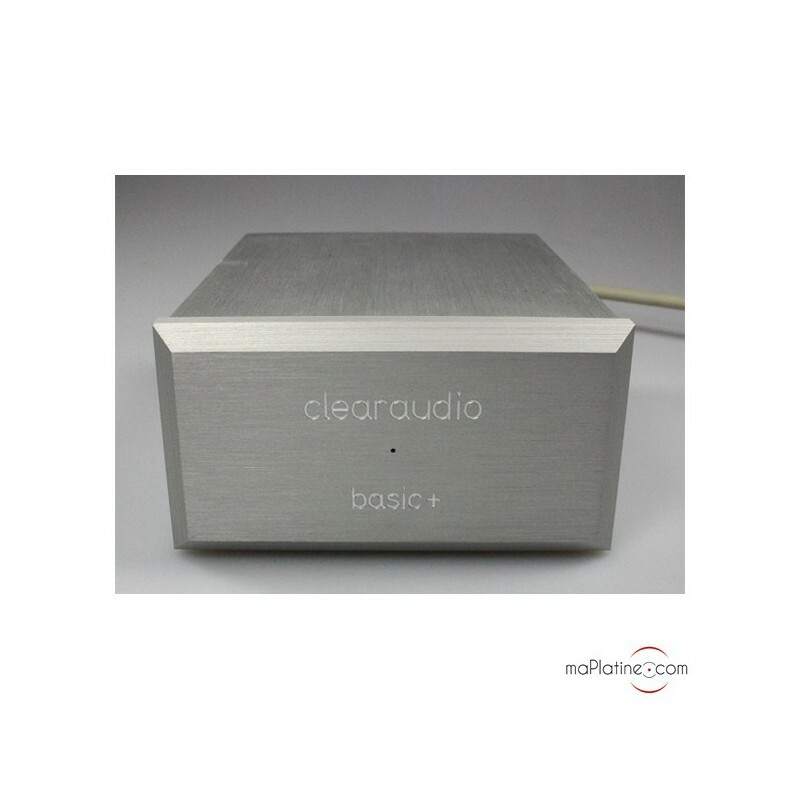 Obviously, Clearaudio designed it to be perfectly compatible with its own MM and MC cartridges, though it is also compatible with all other commercially-available cartridges. The music is full of enthusiasm and punch with a wide and precise sound stage. 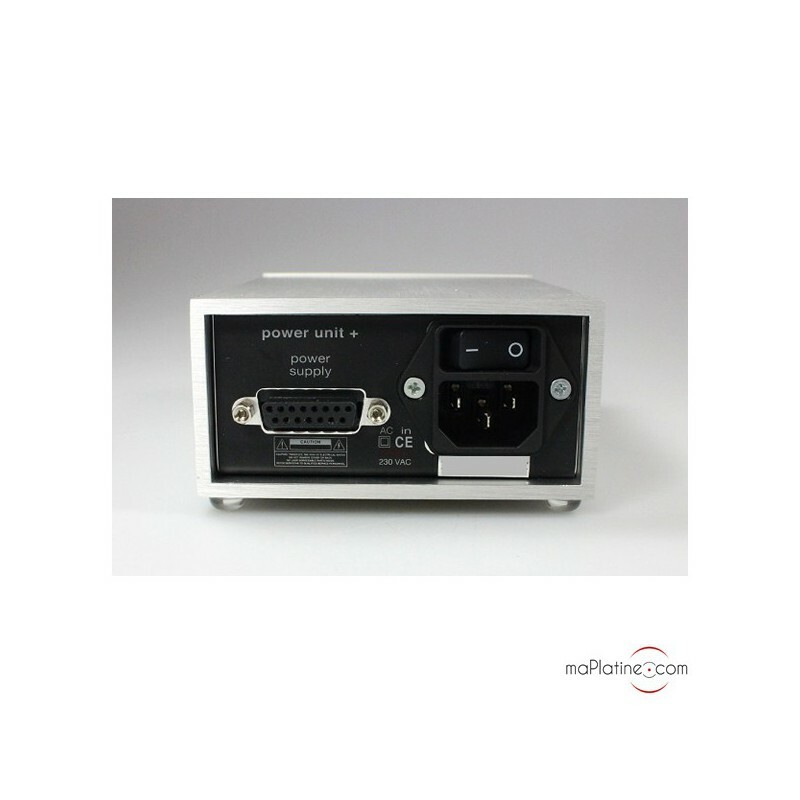 For best results, the manufacturer encourages the lucky owners of a '+' preamplifier to add the battery-powered Accu Plus power supply. It wards off background noise and distortion, delivering amazing transparency and precision. 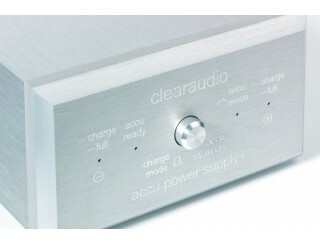 This great preamplifier will be a perfect match for the best turntables and cartridges on the market. Highly recommended! Merci d'abord à Maplatine pour leur professionnalisme :) ; dès les premières écoutes, on est frappé par la clarté, la dynamique et cette restitution détaillée; j'étais sur le point de vendre ma P3 ou de remplacer cette Elys II que j'ai fini par trouver trop confuse, je me rends compte que mon Fono faisait certes le boulot mais avec une certaine paresse; le minimum syndical dirons-nous. Cela dit à 295e le préampli (en 2005), il ne faut point s'attendre à de grands miracles. Le Basic +, pour l'heure, offre un éclairage nouveau sur mes vinyles. Plus de détails, je l'ai déjà dit, bref pour 700e, c'est parfait. L'écart entre un préampli à 300e se justifie pleinement.